"I had money and I couldn't pay," he said. "The potential societal cost of a cashless economy I think outweighs the potential benefits for businesses," said Ritchie Torres, a New York City councilman for the South Bronx who introduced the bill. Policymakers argue that while cashless enterprises aren't widespread now, the practice could expand to more services, including some that cater to lower-income people. Walmart-owned Sam's Club opened its first cashier-less store in Dallas last year, using technology that allows customers to scan and pay for items with their smartphones. Kroger has installed similar technology in about 400 stores nationwide. Figueroa is among the much larger group considered "underbanked," meaning they have a primary bank account but regularly rely on alternative financial services like check cashers. More than 24 million U.S. households are underbanked, according to the FDIC. "There are no bad guys on this issue. Everyone is trying to do the right thing and make sure there are no unintended consequences," he said. There are no overall estimates on how many U.S. stores have gone cashless, but it remains a rarity. In New York City, the trend appears to be gaining traction mostly with "fast casual" dining establishments like Dos Toros. Far more common are stores that require a minimum purchase for non-cash payments. "To call this a trend is a bit of an exaggeration," said J. Craig Shearman, a spokesman for the National Retail Federation in Washington. "It's not something the average customer would expect to see at every store at the mall any time soon." 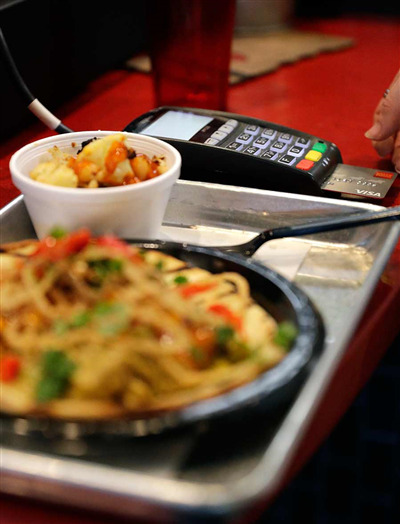 In testimony to a New York City Council committee, Kremer argued that businesses that "consistently serve the unbanked and underbanked population aren't going to go cashless. It wouldn't make sense for them." "I'm uncomfortable with the idea that certain people don't shop here so it's fine to exclude them," said Justine Zinkin, CEO of Neighborhood Trust Financial Partners, a financial counseling nonprofit affiliated with the credit union where Figueroa banks.